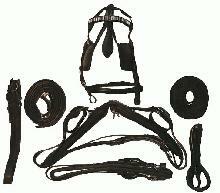 Description: Complete leather driving harness set in storage/carry bag. Color & style of bag may vary from the one pictured. The saddle and girth strap hooked together measures approx 78" when left out to the last hole on the girth strap. The tail crupper which is attached to a leather strap that runs to the saddle measures 44.5" when adjusted to the middle buckle. The bridle (includes blinders) measures approx 40" from bit end to bit end when adjusted all the way out.